That milk-braised pork I made last week for supper club? Here’s what I did with some of the leftovers: a lazy approximation of the roasted cauliflower pasta from one of my favorite cookbooks, Olives and Oranges. 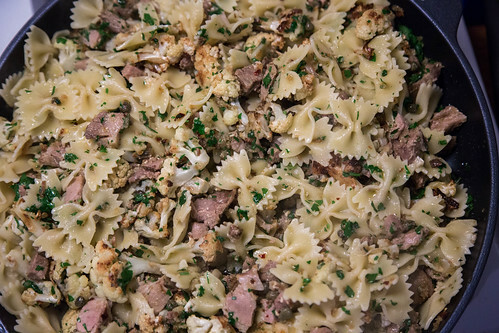 I sauteed garlic, anchovies, hot pepper flakes and breadcrumbs in lots of olive oil, then threw in capers, cauliflower florets roasted until sweet and golden, minced parsley and diced-up leftover pork, then added bowtie pasta and let it all simmer for a minute. Daaaaaang.